Background – If the Fire Luigi, Dry Bones, and Boo figure pack is utilitarian, then the second most common pack in Micro Land is where things get crazy. While Toad and Lakitu are popular choices and a safe decision to create by Jakks Pacific, Sumo Bro. is one of the more unconventional figures they’ve produced yet. Let’s take a look at each figure to see if this figure pack is worth owning. Toad – We will start with the biggest disappointment out of the three. Toad looks nice with decals on his face and has a pretty solid paint job. The problem is that his head is heavier than his body and you will have a lot of trouble getting Toad to stand up without help (like the Sumo Bro. kindly did in the picture). This is definitely the kind of issue that hurts Micro Land’s credibility compared to other toy and figure lines and is something I hope Jakks Pacific will improve and fix in the future. Lakitu – I’ve always feared Lakitu when playing Mario and yet find him charming when he isn’t showing up to ruin my day. This Lakitu has a nice pose and is clearly on the lookout for Mario. Lakitu has inconsistent painting on his glasses and if you’re buying him in store, be sure to look for one that has nice black frames. The cloud looks great and so does the design on the back of his shell. While it is hard to prop Lakitu up in the sky with no stand, Lakitu is an excellent addition to Nintendo Micro Land and a figure many people will enjoy owning. Sumo Bro. – Sumo Bro. debuted in Super Mario World (and in football gear) and he has since appeared without his equipment. I would say he is definitely one of the fiercest regular enemies in Mario games and to get a figure of him (as far as I know, the first ever in the United States) is incredible. Sumo’s paint job is not bad and while mine has a few small errors, details like his tongue and eyes are very well done. Jakks did a nice job hiding his product number on the bottom part of the shell so it is less noticeable too. I love this figure and think Jakks Pacific really nailed Sumo. I’m so happy to have Sumo Bro. and will use him in many levels I build in the future. Closing Thoughts – I’m glad this figure pack is relatively common and still available online at the time of the review. It has a nice combination of common and obscure characters. 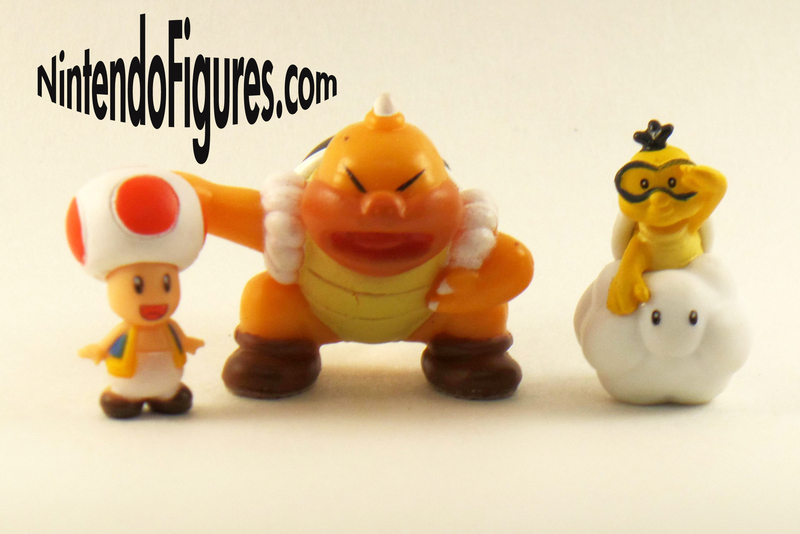 While Toad is disappointing, because he is a staple of Mario games, and you get some awesome characters like Lakitu and Sumo Bro., I definitely recommend this pack, especially if you can find one with a nice paint job on the figures.